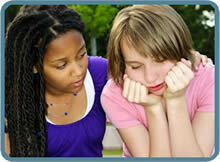 Home » Your Questions: Teens » Can I change my mind once I’m in the clinic? You can change your mind about having an abortion and leave the clinic at any time unless – the surgical suction cannula (tube) has been inserted through your cervix and into your uterus. Even if you’ve swallowed the abortion pill (RU486; Mifepristone). After leaving the clinic, immediately make an emergency appointment with another doctor. There is a protocol for reversing the effects of RU486 which involves dispensing progesterone. Do not take the follow-up (second step) medication, Misoprostol, which the clinic may have given you to take in a couple of days. Even though you were scheduled for a second trimester abortion and laminaria has been inserted in your cervix. The laminaria (sterilized dried seaweed sticks) can be removed by a qualified healthcare provider. It is vital that this be done as soon as possible after you leave the clinic. Even though you’ve already paid for the abortion. The clinic is legally bound to refund a portion of what you paid. You are responsible for paying for services rendered, which may include lab work, ultrasound, medications, and other prep-work. Even if you’ve been given pre-op medications by pill, injection, or IV. Even if the doctor, staff, counselor, or nurses encourage or pressure you to stay. Only if a surgical suction cannula has been inserted into your uterus is it too late to leave. Even if the person who accompanied you to the clinic will be upset. Even if the baby’s father will be upset. Even if friends or family members who supported your decision to have an abortion will be disappointed or angry. You are the one who must live with your decision for the rest of your life. If your heart tells you that having an abortion is not the right choice for you, then exercise your legal right to choose what happens to your body and your baby – leave the clinic.